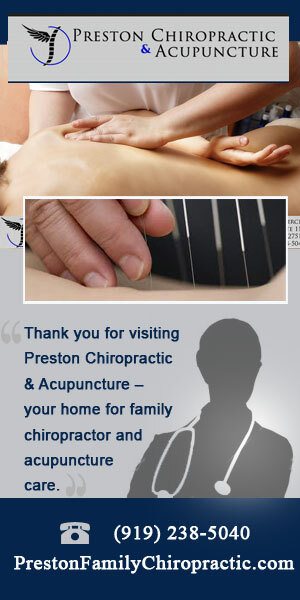 At Preston Family Chiropractic, we specialize in expert chiropractic and acupuncture services, in addition to medical massage. We put your health and wellness first, and our primary concern is your comfort and wellbeing at the end of the day. We focus on offering you the best Cary chiropractic care and Cary acupuncture services, as well as Cary medical massage. Adjustments from one of our Cary chiropractors are an extremely effective and safe way to treat back pain. Our patients who receive chiropractor adjusting may hear a small popping or cracking sound in their back — this is completely normal. As they are stretched, your spinal joints make this sound. Surrounding these joint capsules in your back is tissue fluid. In this fluid are bubbles are other air pockets. The popping sound is the result of the rapid shift of air when the joint opens and the joint tissue stretching when adjusted. Learn more about the specifics of our Cary chiropractor techniques by visiting our Chiropractic Care page. We can guarantee you the most complete analysis, attentiveness, and treatment of your health through our utilization of acupuncture. Our way of attending to your particular acupuncture needs is gentle, safe for patients of any age, and are time-tested over centuries of continuous practice. The principles we use with our Cary acupuncture have existed for over 5,000 years. The treatment is rooted in the concept of chi. Just as water flows through a river, chi flows through your body in channels referred to as meridians. Similarly, a large rock may divert or completely block the flow of water, causing a buildup of stagnant water. Learn more about our Cary acupuncture services by visiting our acupuncture page. Medical Massage is result oriented and the treatment is specifically directed to resolve conditions that have been diagnosed and prescribed by a Physician. The focus of the Medical Massage Treatment is ONLY on the areas of the body related to the diagnosis and prescription. Some of the benefits of medical massage include realasing tight and sore muscles, relieving nerver compression or entrapment, and increasing flexibility and range of motion. At Preston Family Chiropractic in Cary, our focus in medical massage is getting YOUR body to its very best. *We utilize cutting-edge technology to assist the patient in achieving their maximum health potential.